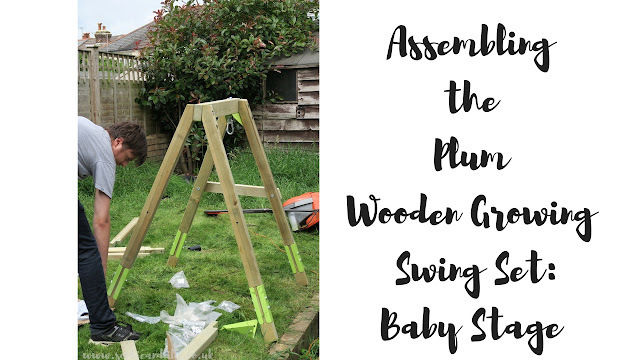 There is no wonder why the Wooden Growing Swing Set by Plum has won numerous awards; it is capable of seeing a family of children from babyhood right through to the teenage years, which makes it a fantastic investment for the garden. Lily and Alexander received the swing set in return for a review and they have waited very patiently for it to be set up. Upon our return from holiday Rob started assembling the swing for the baby stage which I would deem to be suitable for babies who can sit up independently until 2 years old. Reaching a height of 122cm at the baby setting, the swing doesn't take up a huge amount of space in the garden or outdoor space and since it is suitably short for a baby it looks perfectly inviting and not as overwhelming as a full-size swing. 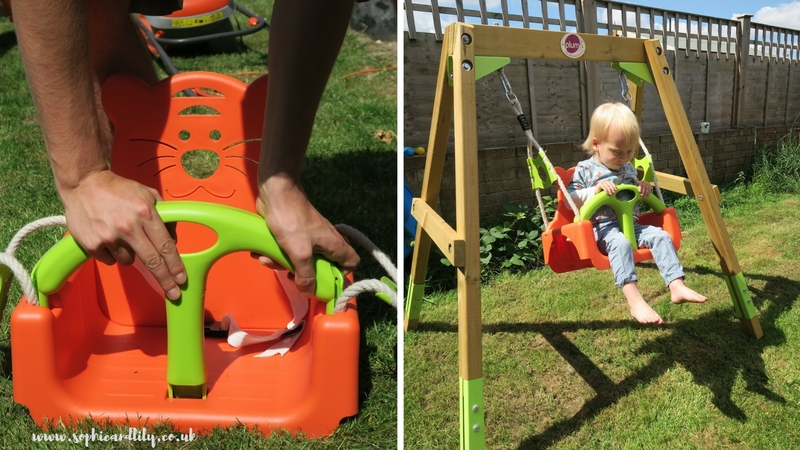 The seat with a fun cat or tiger design features a lime green lap bar to provide additional security for babies - just like what you will find at the baby swings at the local park. We found them very sturdy and rigid to slot in so we were reassured that Alexander (age 2) would be well-restrained, particularly with the addition of the harness which secures around the waist. Alexander is at the stage of being interested in clips and harnesses and tries to secure it around himself, but as yet he hasn't been able to unclip himself. The length of the ropes which suspend the baby stage swing seat allows a very gentle swinging motion within the frame; you can't overdo it that is for sure. Alexander is a small, light two year old, but getting him in and out involved ducking his head so he would't hit it on the top bar of the swing, so after experiencing the baby stage we decided to extend the height of the swing with adding the leg extensions. Children have the option of holding onto the plastic seat itself, or the poly hemp rope which is soft and pliable on delicate little hands. Since Alexander was able to use the baby stage swing, Lily felt like she was missing out. This is the only real conundrum I can see with owning a single Plum Wooden Growing Swing Set. Whilst it may be ideal for one child, seeing them through the different stages the swing can accommodate for, it may be prudent to have a twin swing set or two single swings for multiple children within different age ranges. We are expecting our third baby in December, so by the following summer the baby could potentially use the baby stage swing, however after the disassembly of the toddler/child stage, it could have to remain exclusively for the baby which would not be in the best interests of the two older children. Lily enjoys pushing Alexander and at least I know he can't be pushed very high! 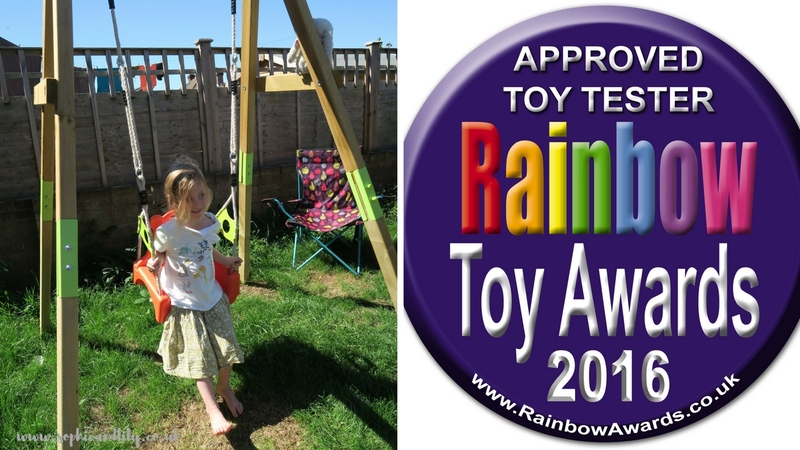 For both children to use the swing with the legs and height extended to 190 cm the green baby seat bar had to removed and it will make a reappearance next year for the new baby and the swinging motion will just have to be gentle and monitored especially if the older children heavy-handedly push it! 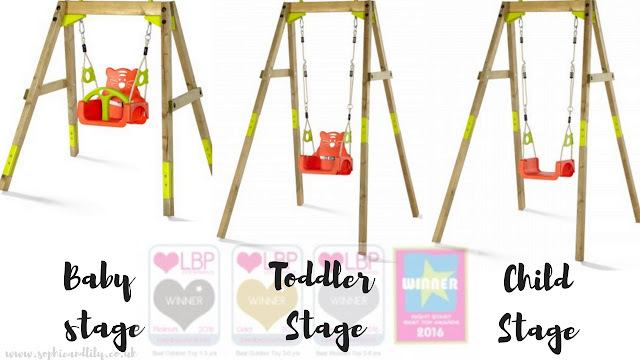 The upper weight bracket for the swing to be used in the child stage is 45 kg which could see them using it at least until they are 11/12, if not beyond. The Plum Wooden Growing Swing Set feels particularly robust and well-manufactured combining premium FSC certified, pressure treated pine and easy to clean plastic. It will withstand the elements and the seat will just require a wipe down following poor weather. The swing ropes should last as long as the complete set but may be prone to some discolouration, as could the seat plastic, such as sun-bleaching. In terms of instructions, the diagrams were clear but bear in mind that you will require a few tools for assembly, notably a ratchet socket wrench x 2 with two 13mm sockets and one 17mm socket. We didn't have one of these so our assembly was a bit delayed. I got the children to stay inside until the swing was up and they were very surprised and pleased to discover a new piece of garden play equipment. Providing you have the necessary tools, the estimated time it takes to complete by one adult seemed about right; 60 minutes. Lily prefers the security of having the back support of the seat still in place, which means she can attempt to jump on without falling out the back. This is also ideal for Alexander too. As always, parental supervision is important. Both children absolutely adore their first ever swing and as parents we are impressed that it is simply more than just a standard single swing and can cater for all of the children's age ranges. It will provide them with lots of fun outdoors in the fresh air, come rain or shine. 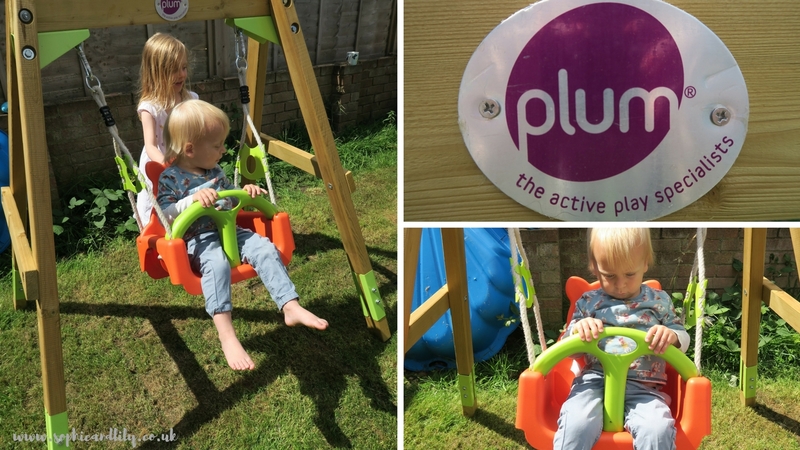 The Plum Wooden Growing Swing retails at an RRP of £159.99 from the Plum website. 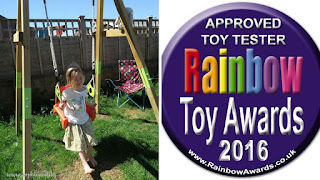 We received the swing in return for an honest review for the Rainbow Toy Awards.